A team’s performance is built on a foundation of integrity. Just like a building, the bigger it is the deeper its foundations need to be, and those foundations need to have absolute integrity or the consequences will be catastrophic. An executive leadership team’s accountability is an awesome ‘structure’ they have to build and/or manage and too often the level of integrity they are operating at as a team is insufficient to have that work be as successful as they intend. 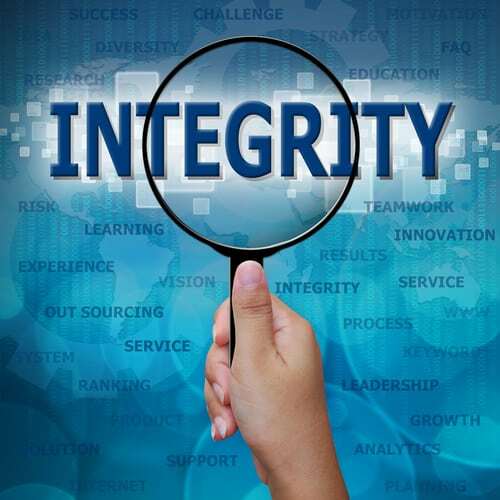 We often think of integrity matters in organisations in terms of things like falsifying financial records, giving bribes to win work, mishandling customer investments and the like. But the source of those incidents is actually the everyday integrity matters that happen in people’s relationships, and particularly those of the executive team. The big incidents are a symptom of a much larger systemic issue that is often known by team members and the people in their organisation. • Not keeping promises and/or not acknowledging when a promise is not going to be kept. • Saying you agree in the meeting when in reality you are not in agreement. • Not confronting one another when something is being done that lacks integrity or is inconsistent with what has been agreed to in the group. • Allowing destructive or dysfunctional behaviours by individuals in the team. • Accepting justifications and excuses for non-delivery. • Ignoring people, their communication, contributions, gestures or intentions. • Not listening to one another. • Tuning out when people are talking about things that are not related to your accountability. • Gossiping, lying, manipulating, or taking advantage of something you know to be detrimental to someone else. The consequences of these kinds of issues are much larger than people appreciate. In our work with leadership teams it is ‘normal’ for people to be operating in a compromised state – and what’s worse is they often know that they are. One of the biggest consequences felt by already time poor executives is the amount of extra time this condition robs them of. Then there is the obvious lack of real alignment and collaboration. Lastly, the awesome potential offered by bringing together an intelligent experienced group of people gets sucked into a black hole of mediocrity. Check out our new ‘Teamwork Woes’ video feature for more amusing examples of leadership team integrity issues and their consequences, you’ll get a laugh.